You can download the materials and progress at your own pace. Stage One Course – Free! Reader friendly, but you still learn much. Visit my articles page and read any of the over one hundred articles that interest you. This one is for free from your computer or mobile device – you learn just what you are interested in. Set aside some time each week to become familiar with what is known about food sensitivity. Read about topics such as: Food Sensitivity Exists, Is food intolerance an inborn error of metabolism? Fastest way to your own diet, Do you need to go on a wheat-free diet? FODMAPS not the whole story. You can check out the Symptoms category – IBS, eczema, ADHD, migraine, headaches, reflux, even bad breath, mood changes, and for the important tyramine sensitivity syndrome. You can learn about what causes reactions: Findings from 500 families with ADHD using diet, Salicylates are important exclusions, Important references on amines, The delightful relief of adding milk to a milk-free diet. Are You Food Sensitive? helps you understand food sensitivity, which chemicals need to be excluded, how your Family Sensitivity History helps, putting your diet together, managing commercial foods, managing food sensitivity in a baby, challenging to get to your own diet, cooking and recipe changes, nutrition and long term management. Fussy Baby provides information for parents whose child is not happy. There is discussion about when the introduction of solids gets complicated, why different babies develop eating habits at different rates, is your baby food sensitive? and supersensitivity in food-sensitive babies. Tolerating Troublesome Foods provides the detail of understanding adverse reactions and individual differences, why tolerance changes, learning how to minimise reactions to over 300 foods using the Best Guess Food Guide, and testing foods from low risk to high risk foods. 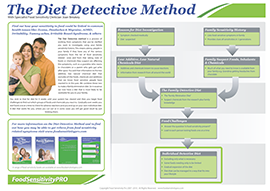 The Dietitians Manual provides over 50 pages of help for dietitians who want to provide useful information to patients wishing to investigate their diet, using the diet detective method, really applying ideas to support each individual developing their own best diet. It includes managing the low FODMAP diet at the same time as managing a low chemical diet. The Masters Thesis provides the detail of the scientific background to the development of the diet low in additives, salicylates, amines and monosodium glutamate. Interesting sections cover the literature background, clinical research into 500 families using diet, and 113 families followed up in detail, and a discussion addressing exactly what the diet should involve. This gives an understanding of how the diet developed and why there is ongoing development. e-Books to download and print: you can obtain all the e-books which includes the PDF Professional Pack (eBook) and Tolerating Troublesome Foods (eBook) for $65. The thesis (eBook) on the diet development is included. You can download them immediately and read or printout whatever you wish. You can go to any book and read what you need at any time. Over time you will become familiar with all aspects of this fascinating area of science. Kindle or eReader: you can go to AmazonKindle and obtain Are You Food Sensitive?, Fussy Baby and Tolerating Troublesome Foods for just $5.50 each. You can add the thesis from my site for $5 and the e-Dietitians manual from my site for $15. This option will cost only $36.50 for all books.